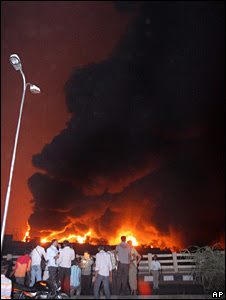 The toll in the fire at Indian Oil Corp's fuel depot outside the Pink City may rise to nine as six missing employees are now feared dead, even as fire fighters and the Army worked to contain the blaze that has burnt about Rs 150 crore worth of auto fuel. "Three civilians are confirmed dead and one is seriously injured. Six of our staff - three officers and three blue collared employees, are missing," IOC Chairman Sarthak Behuria, who visited the accident site this morning, said.